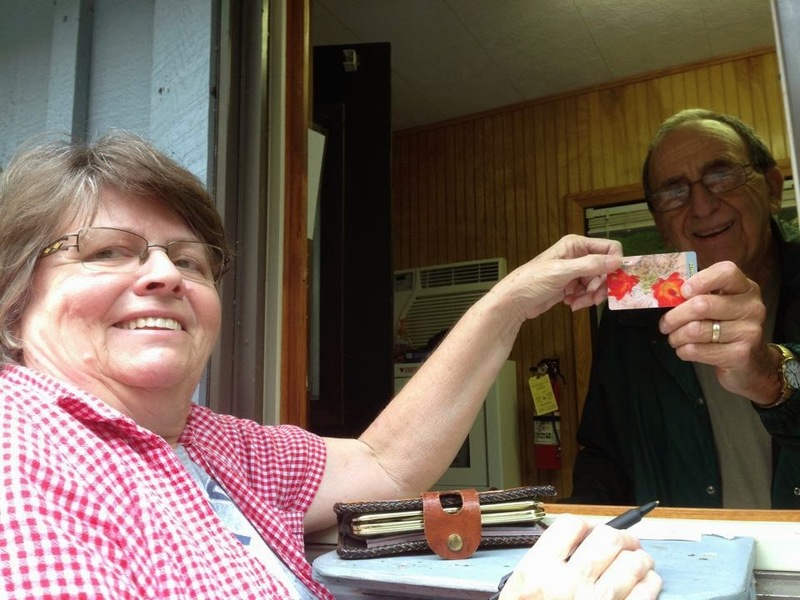 My RVing friend, Donna joined me at Peaks of Otter campground and got her National Parks Pass. This was her first time driving on the Blue Ridge, so that was quite an accomplishment since she's afraid of heights. Donna standing by Polly Woods' Ordinary, an historical site at Peaks of Otter. A view from the trail around the lake. We made a day trip to Bedford, a little town in the shadow of Sharp Top. We were going to visit the National D-Day Memorial there. 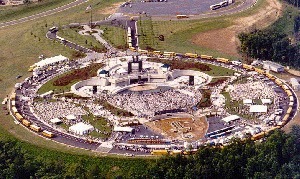 This is an aerial view of the Memorial borrowed from their website, probably taken when it was dedicated, judging from the crowds. It is quite a large complex. You might ask, as I did, why the small town of Bedford? This community suffered the greatest loss per capita of any US community on D-Day…20 young men from Company A, most of whom died in the first ten minutes of the invasion on Omaha Beach. 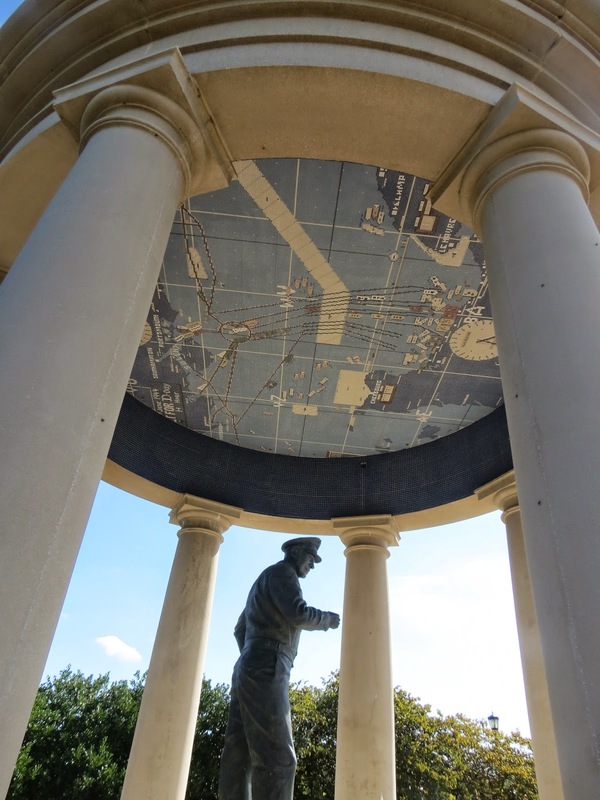 Recognizing Bedford as emblematic of all communities, large and small, whose citizen-soldiers served on D-Day, Congress warranted the establishment of the Memorial here. 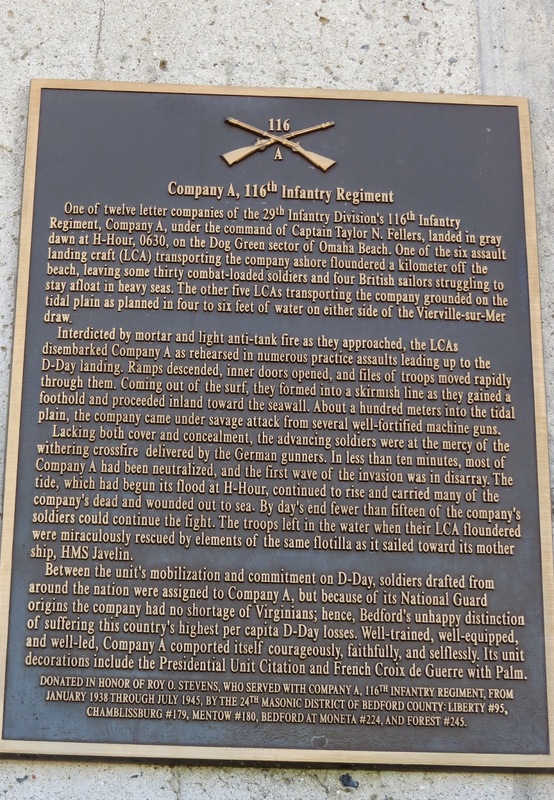 The men of Company A were the first ashore that day, landing on time, at low tide, and came under a barrage of German gunfire. We had a guided tour which began in this area where we learn about the leadership and planning for the Allied Invasion. A formal garden was planted in the design of the Supreme Headquarters Allied Expeditionary Force shoulder patch, its crusader sword pointed toward the triumphal arch. It symbolizes the landscape of England and the planning and preparation that the allies engaged in there. 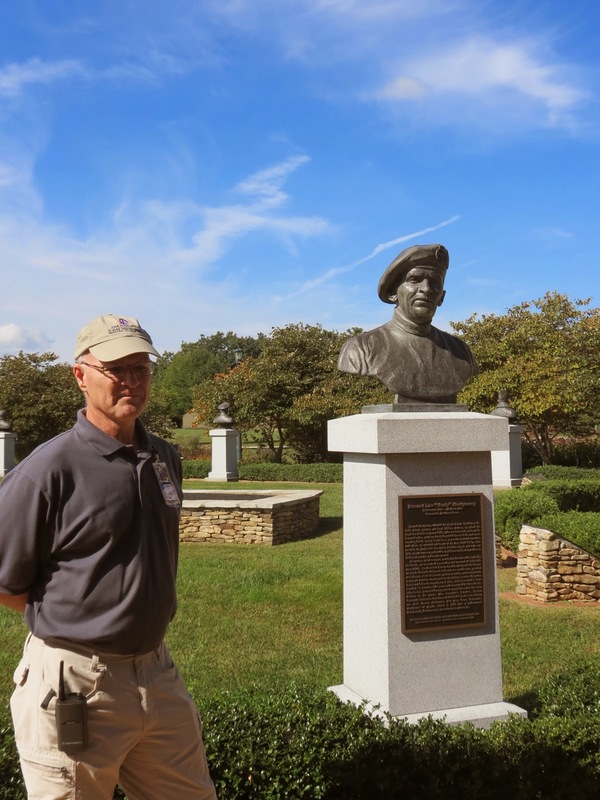 Our guide introduced us to each of the generals and other leaders and advisors with historical facts and interesting anecdotes about each. Of course, the supreme commander was Dwight D. Eisenhower, seen here beneath a map of the D-Day invasion. This central plaza has 5 symmetrical segments alluding to the 5 Normandy beaches represents the landing. The structure on the right represents one of the landing craft, and the statues represent soldiers attempting to reach the beach and beyond. Sprays of water represent shots fired on them by German soldiers in bunkers above the beaches. What it really looked like that day. Perhaps this soldier represents one of the Bedford boys. His bible (beside the fallen soldier's head) was recovered and returned to the family. The names of 4,413 Allied and American troops who lost their lives on 6 June 1944, are engraved on plaques at the Memorial. The landing as seen from above. You can see the Peaks of Otter in the distance. The triumphal soldier scaling the seawall. There happened to be a fall festival in the town of Bedford that day, so after our visit to the memorial we walked around there, visited the museum, and had lunch. On the way back to the campground we stopped at an apple orchard for fresh apples and cider. And neither of us could resist a warm fried apple pie. There's a lot to see and do in the area around the Peaks of Otter. Good tour and that apple pie looks scrumptious but not as good as one I've seen from your RV oven.